I'm also trying to figure out how to deal with the flat underside surface we discussed earlier. 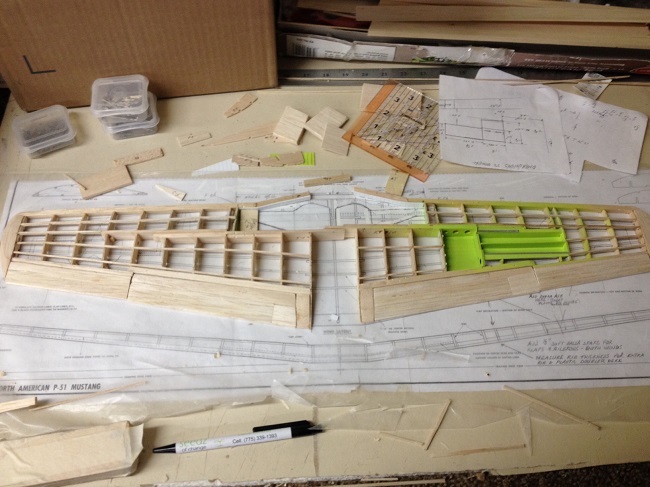 The last picture shows to good effect the extra chord length that resulted from my revising the leading edge outline from the previous post, and the potential issues of trying to deal with the saddle to the fuselage. I'm at the point now of trying to determine the best way to fill in the wheel wells and a means of support for the top surface covering. Normally, this wouldn't be an issue if I wasn't opening up the wheel wells. 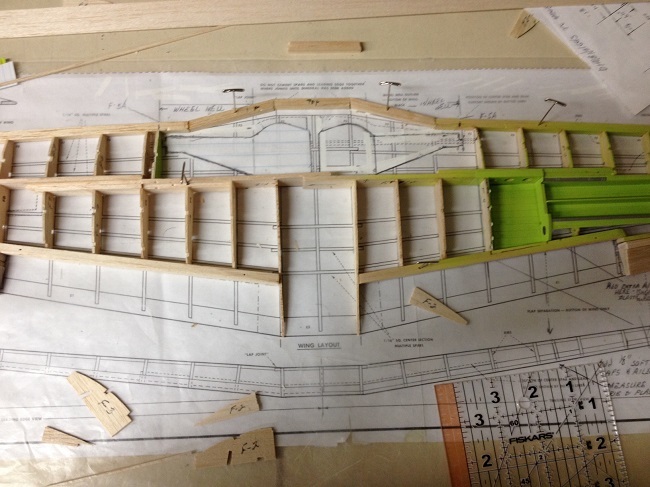 The wing itself would be just constructed with the kit-supplied balsa ribs all the way to the root. However, opening up the wells presented itself a whole new avenue of "how to" on the wing. First off, I initially started outlining the wheel wells from the Guillow's plans to highlight the cutouts I would make to the underside surface covering when I noticed the discrepancies between the outlines drawn on the plans with the outlines of the scale drawings. This would also reflect on the outlines and fabrication of the inner wheel well doors hanging down. 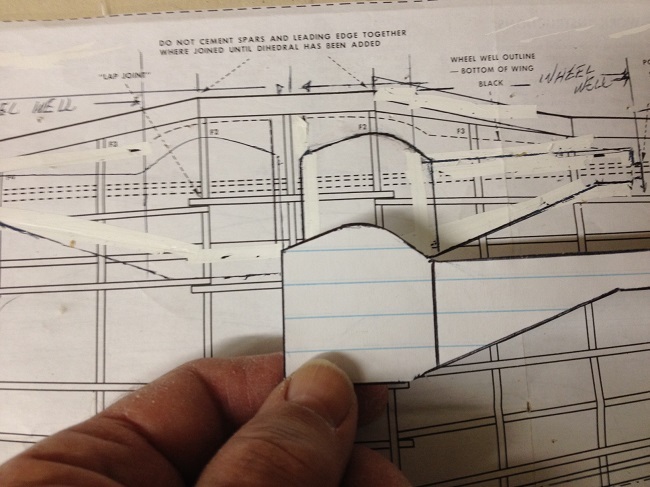 That's when the magic "White Out" tape came into play and from there, I also used a compass to help me extrapolate the outlines and enlargements. The end results were reasonably close. Some compromise had to be made balancing out the true fidelity of outlines with the construction of the model. I only needed to recreate one outline. I decided on a whim to do the right one. After all the corrections were made, I took a piece of school notebook paper and traced the outline of my "new" borders. Then I simply flipped it over to the left side to ensure that they both were evenly matched, errors and all. If you look carefully at photos 7A & 5A you'll see that I also changed the leading edge of the wing at the root to reflect a more close outline of the wing. 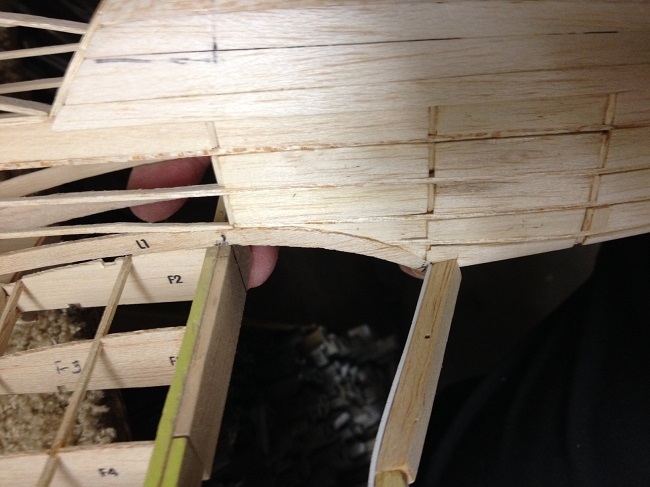 Yep, this means a bit more work on the saddle portion and how to deal with (now) a larger wing root chord. 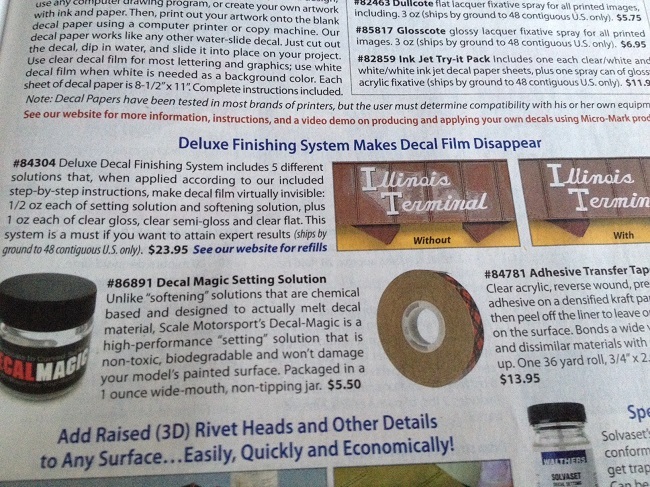 I'm enclosing a few photo-copies from MicroMark's catalog to illustrate my efforts at addressing potential decal issues. 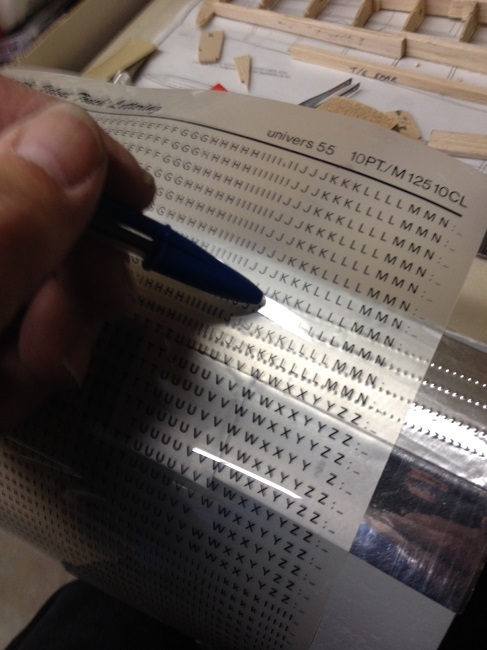 Since this is to be metal-foil covered and my tests have revealed that this type of film coving will present decal challenges, I've searched through various catalogs and came up with some of these. 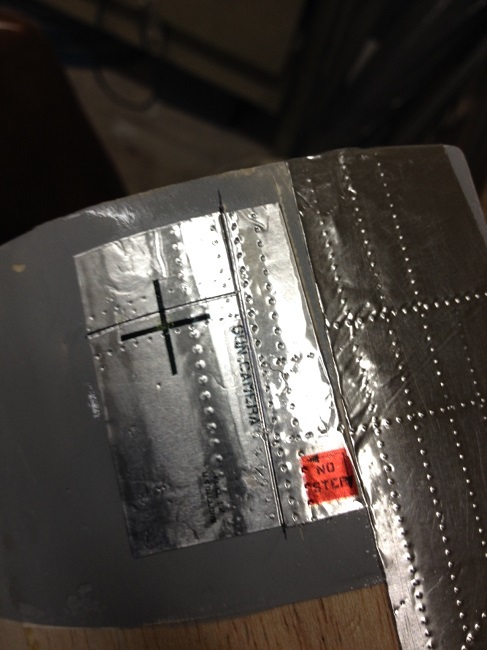 The first picture shows the rivet decals that I used with great success on my Guillow's S.E.5 build. They really do stick out like small rivet heads. Saved me a lot of time and headache on trying to simulate rivets the old fashion way of using pins or glue drops. 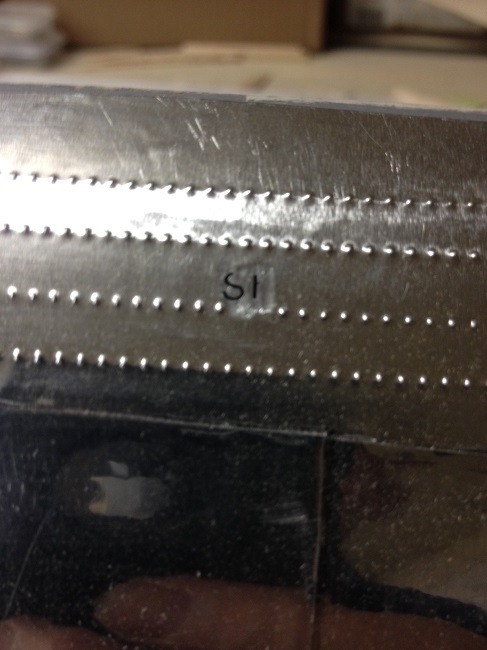 The second photo shows their product - # 84304 - that will make "silvering" disappear. Because their ad for this product is more narrow and somewhat smaller, it can easily be confused with their "Magic non-toxic" setting solution seen just below. This is what I was explaining in my previous posts. 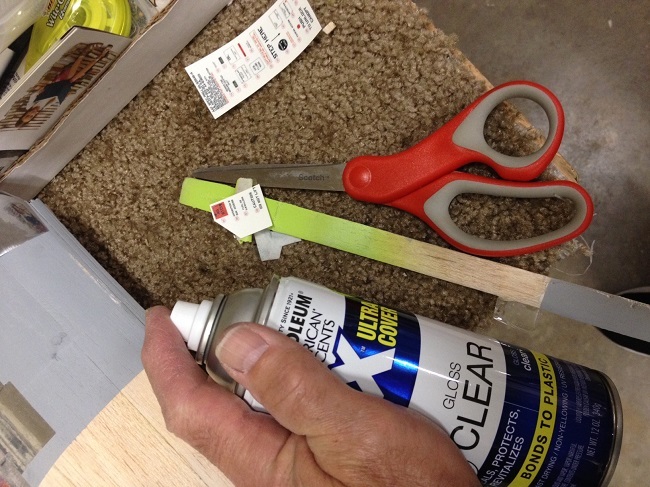 However, upon carefully reading the use of this product, it really boils down to common sense of: first applying a clear coat of paint over the finished surface (this includes the color paints as well). The clear coat covers over all of those tiny microscopic holes & irregularities that are a natural product of almost any finished surface. These irregularities are so tiny, that you would literally need a microscope to see them. But they're there and will fill up with equally tiny air pockets and this in turn, will suspend the decal over the surface. This tiny suspended space between the decal and the finished surface is what gives the decals a "haze" that is so commonly seen. This haze is called "silvering." I know I explained all this previously, but it's worth noting that they emphasized to use a "special clear coat" of their product first before applying the decals, and right there was a dead give-away to what is really needed to be done. Then they suggested after applying the decals over the dried surface, to use their special setting solutions and it went on from there. So, it really gave me a chance to reevaluate all of this and simply use the clear coat of paint method, allow to dry thoroughly, followed by use of any decal setting solution with the application of the decals. Finally, the last picture shows what I think will help. 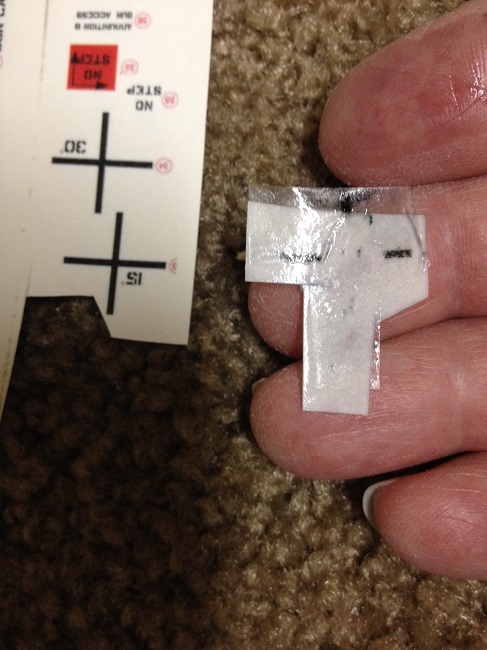 They claim that this product will help eliminate all of the edges around the decals to disappear after the decal has been applied and dried. So, this is the product I'll order and test. All of this testing.... This is what slows down the build, but prevents frustration and more importantly, give a good model without the mistakes. I'm hopeful that my postings will be passed on and taken into consideration for anyone reading them for future builds. 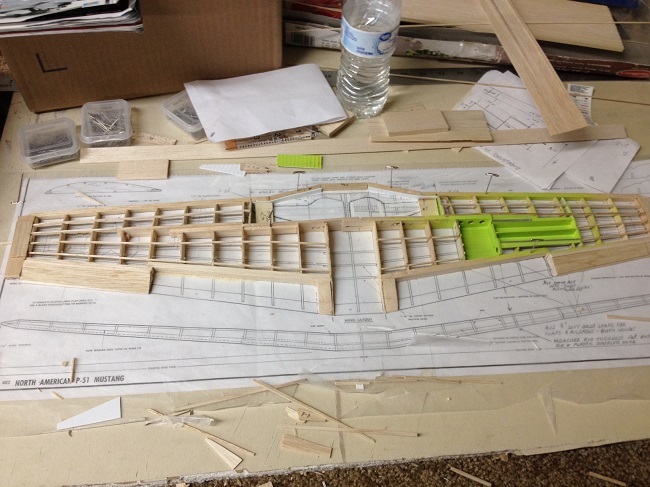 Wing saddle and flat surfaces coming up next. If I'm reading his idea right, is to leave the bottom portion of the wing flat, but add the extra airfoil to the outer wing panels. Does this mean I'll be increasing the fuselage around the saddle to compensate? In another words, the flat bottom of the wing is mostly hidden inside the extra underside of the fuselage? Gary - That was the line of thought I had. Your airfoil on the top of the wing is sized to fit the wing saddle exactly, so no change there. 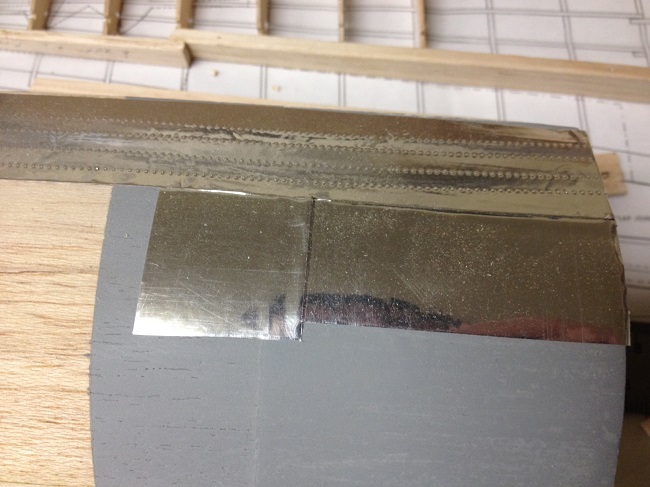 Adding the material to the lower portion of the airfoil to give it more authenticity can then be blended into the fuselage at the flat portion giving you more material to create the fuselage profile and more material to manage the wheel well activity. Good morning and thank you for your inputs. Mike, yep, I'm just doing one opened gun bay, leaving the other "closed" by giving the viewer the chance to see how it looks opened and closed just by looking at either wing. That, plus it really saves me a whole lot of extra work.... Which is probably the real reason but please don't tell. I thoroughly agree with you on the airfoil. 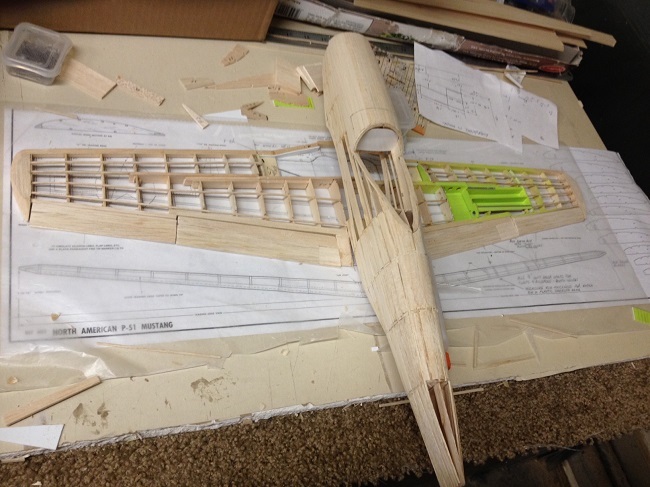 I have to finish off just a couple of items on the wing frames, then, without gluing the two panels together, I'll trial fit them and see how it all plays out and determine what can be done. Mike's idea sounds good. My goal is to emulate the plastic modeler's displays by having the Mustang posed over a mirror to allow the viewer to see the details of the wheel wells. That's when it dawned on me about the airfoils in the first place. 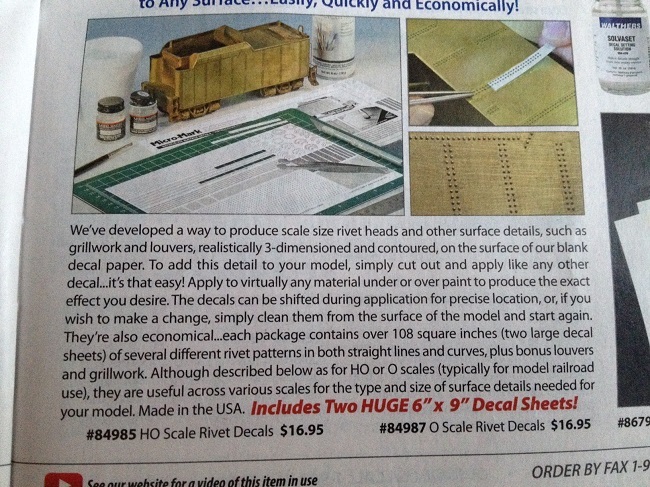 Hence, all that fuss about redesigning the outlines and detailing of the wells. Looks like you've got plenty of leading edge for rounding out the airfoil on the outer panels. I like Mike's solution with leaving the center of the wing "as is" for mating to the fuselage. 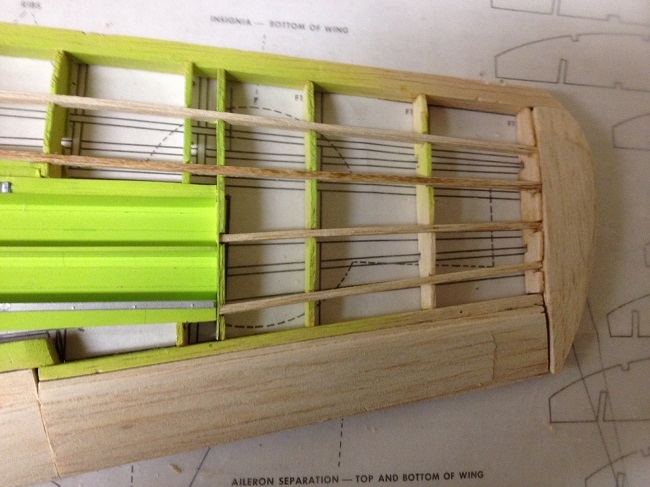 A strip of balsa(sq stringer) on the bottom of the wing ribs could assist in giving the laminar section as well. Sanded to shape. Again, "take my advice and do as you please!" as my father used to say! 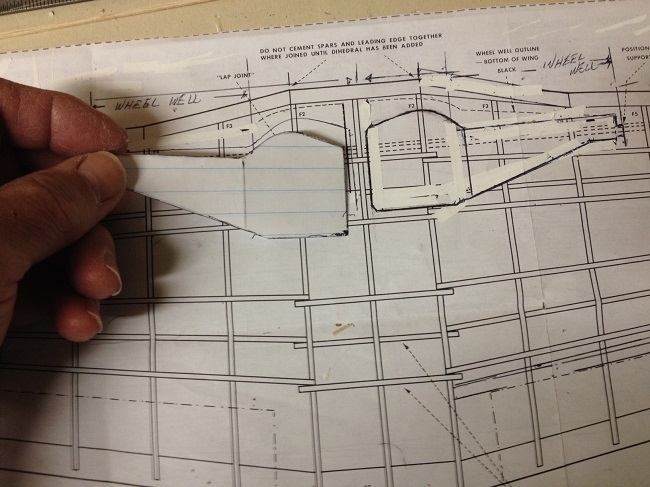 Gary - You could add material to the bottom of the airfoil to give it a more realistic appearance and leave the center section flat bottom to preserve the wing saddle and the overall appearance. On the other hand you could still modify the wing saddle but may put the wing too high in the fuselage, if I'm reading all this correctly. Great work by the way. I'm assuming you are only doing one gun bay? Thank you Sky9, much appreciated. Glad to know we're all in the same "plane." I learned a lot of very good modeling techniques and ideas from reading scale plastic modeling magazines. I've never strayed far from my first endeavors into this wonderful field. I've attended a couple of plastic modeling shows here in the Reno area and was both impressed and disappointed. Impressed with the level of detail and the skills to pull off some of the most fantastic models I've ever seen in recent years. Disappointed that they're so possessive of their craft. When they found out that I also build wooden models, their attitude literally changed instantly from warm and friendly to icy cold and became extremely aloof. It's almost as if I "defected" and betrayed their exclusive hobby. Still, I keep reading many of their plastic model magazines to keep up with the latest techniques, skills, styles, kits, new ways of painting to give that model a more realistic look and the list goes on. I'm now in the process of finishing off the wing frame. The first picture shows the frame in its rough stage. 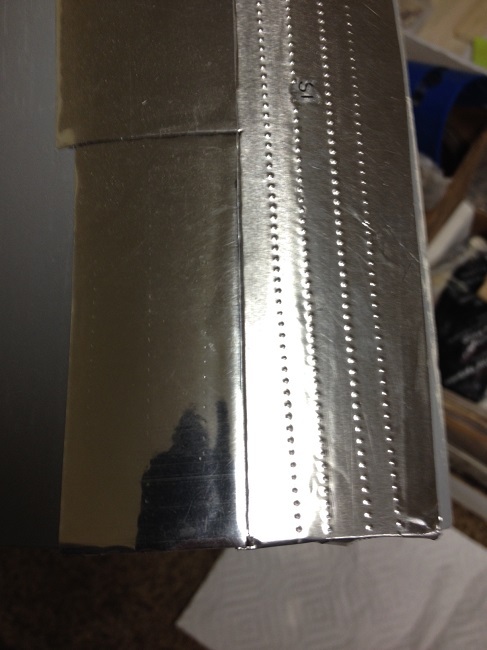 I haven't fabricated the flaps. Since this is strictly a display model, weight considerations were not a factor and therefore to simplify things I decided to simply go with solid balsa. Notice the solid blocked wingtips. 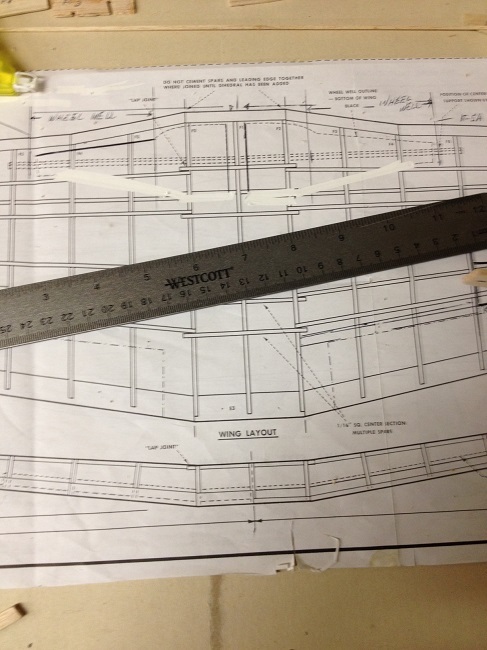 The plans call for stringers to extend from the wings out to the tips. 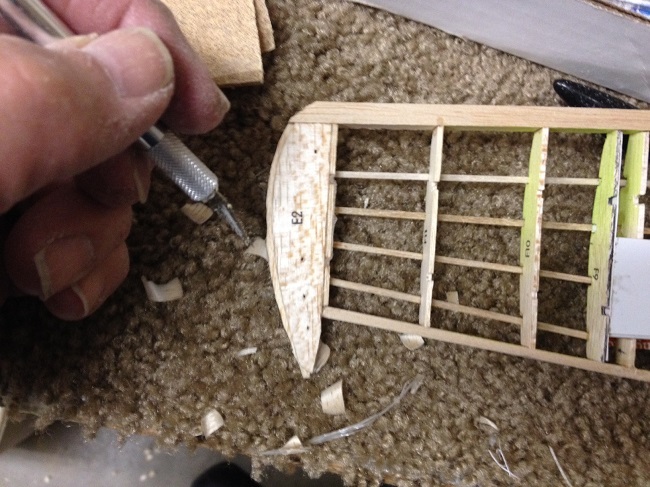 The second picture shows me carving out the excess balsa block to the wingtips. To accurately gauge how much to shave off before sanding, I simply flipped over the frame to reveal the Guillow's wingtip part and followed the outline from there. One really smart move here, I decided to rough out the wingtips and sand them down as close to the outlines as possible before gluing the two separate wing halves together. This reduced a lot of stress on the fragile frame and made sanding much easier. 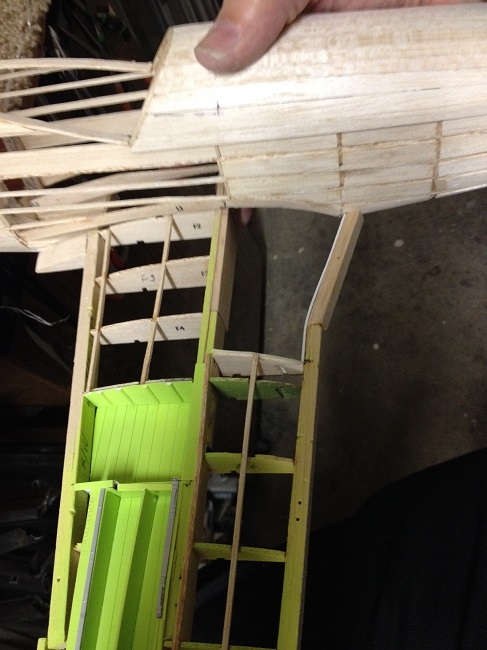 This picture shows the separate wing panels placed on the table as if they were glued together. I have yet to add the dihedral. A good close up of the right wingtip and detail. The last picture shows the fuselage on the wings. Darn, it's really starting to look like a "Stang!" Question or feedback guys: The Guillow's wings are Clark Y airfoil and therefore, they have flat undersides. Should I add some airfoil underneath and add some thickness to the wing? 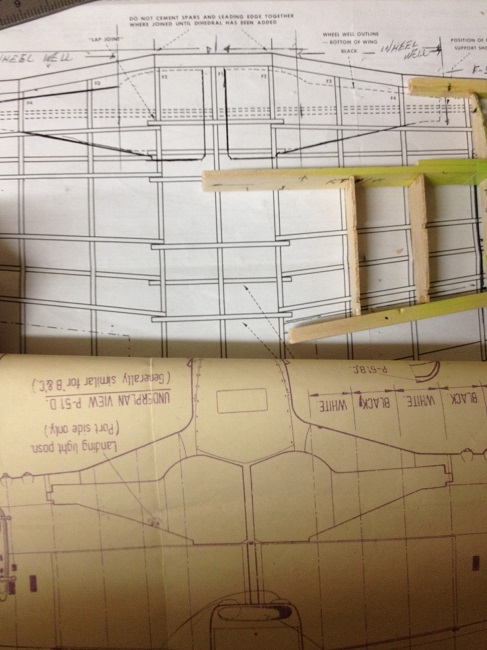 Potential problem is the fit to the fuselage which is designed for a flat-bottomed wing. This translates to a possibility of the wings protruding outside the fuselage outline on the underside. Thanks Gary...great info. 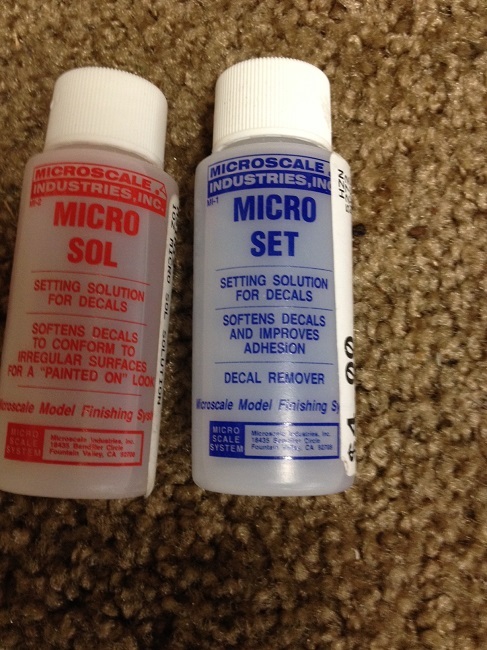 I used Microsol and Microset with my decals in plastic modeling years ago. Great stuff. 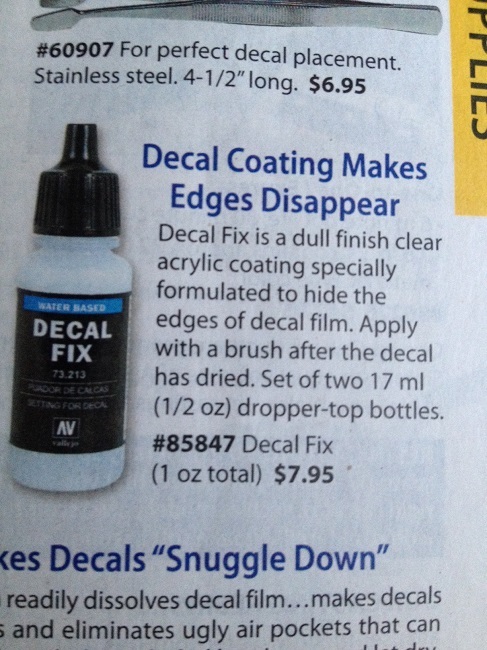 You definitely need a glossy surface for decals to be placed to eliminate that "silvering". This is the final result after a coating of clear paint over the decals. The small cross (which is a symbol for C.G. used for maintenance purposes) really turned out very good. The small red square also turned out good. So, for future reference, I'll have to first add a clear coat of paint over the foil surface to help smooth out any microscopic irregularities that will show up the decal carrier film as "haze" ( In the plastic modeling world, this is called "silvering), cut the decals as close to the prints as possible and use another coat of clear paint over the dried decals. As a side note, it's a good practice to shoot a clear coat of paint over almost all surfaces which will have a decal over it. **Always practice on a scrap piece first. There are exceptions of course, fabric film coverings is one, if the fabric weave is to be seen through the decals in its entirety. However, if you're using tissue coverings, and you're detail-oriented enough (read that, slightly crazy as myself), to add thin strips of rib stitching over the wing surfaces, rivet details on tissue-covered fuselage surfaces and more, then a final shot of clear coat over tissue prior to adding the decals is applicable in this case as well. You really have to look very closely at the "gun camera" lettering to see some of the remaining carrier film. The letters themselves are about 1/16." 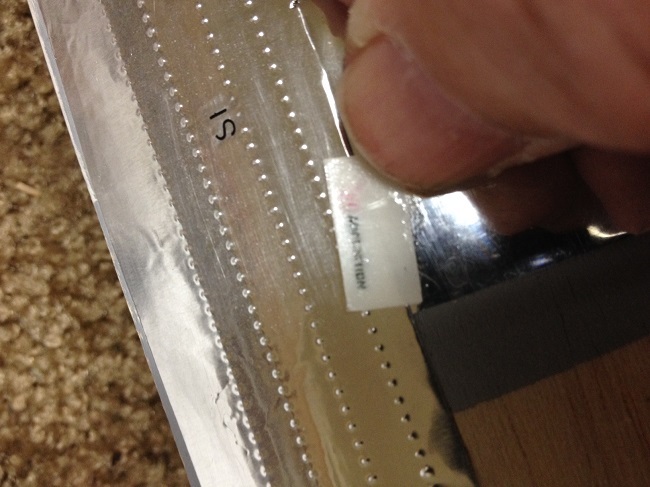 MicroMark sells a special solution that will help "hide" the carrier film from the surfaces. I'll purchase some of this and keep you guys updated. But for now, as everything stands, not too bad. Keep in mind, working with highly polished surfaces, be it paint such as Alclad, silver, chrome or foil covering, any (and all) imperfections will show up. I immediately cut up a couple of decals of stencils and just dipped them in luke warm water like any other decals. Unfortunately, some of them dissolved in my hands and on the surface of Flite Metal. So, I decided a quick shot of clear paint over the rest of the decals will serve to hold them in place and provide a protective cover as well. As you will see, it worked. The vendor promised that he'll use a sealer on my next order. 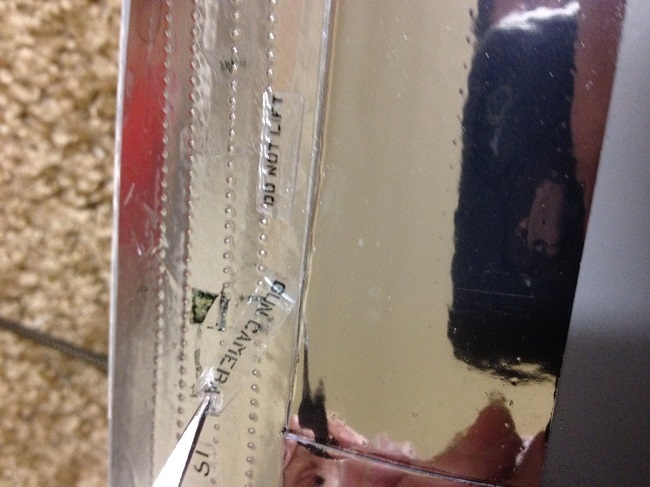 The first picture shows the Flite Metal covering over the proof-of-concept fuselage and you can see my "dents" over the dry transfers from my previous experiment. The picture #4A shows the setting solutions. I did not use them on this experiment but I'll definitely will employ them in the future. 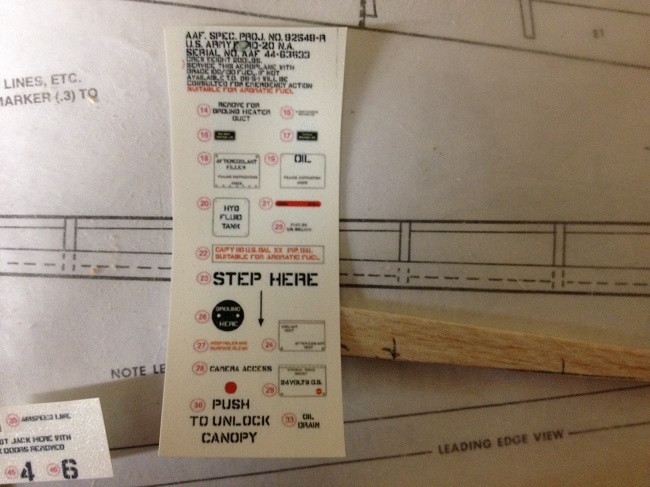 They're really necessary in helping the decals to settle down real tight and over rivet details. Picture # 5A shows the decals dissolving in my hands. I also discovered that the carrier film on the decals really show up on the Flite Metal. I kind of expected this. So after the decals dried, I shot another coat of clear paint over the decals to help blend in the carrier films into the surface. This worked for the most part, but some of the carrier film still shows through. Picture # 7A shows the shot of clear paint over the rest of the decals. Pictures # 8A & 9A really shows off the carrier films to good effect. This means that I will have to cut the decals as close to the prints as possible to minimize any presence of the carrier film as possible. Still managed to squeeze in my hour's worth of research and trying to get some stenciling made into decals. That was the primary reason why I was inquiring about Callie's graphics as opposed to decals. The graphics would have to be thin enough to pass for stenciling and, given the thickness of graphics, I opted for decals. Then I had a choice of either using decals or dry transfers. 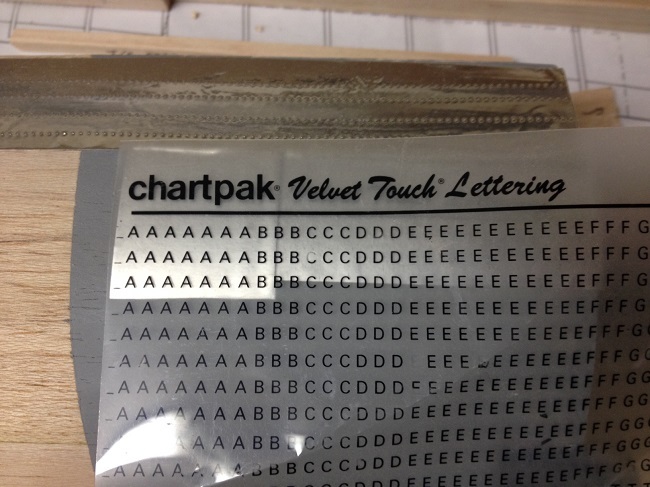 The dry transfers have one major drawback, that is rubbing or burnishing the lettering onto the surface. With the chrome vinyl or Flite Metal as my choice of covering, I didn't want to risk all of those rub marks being passed onto the polished surfaces. I still have several sheets of dry transfers from my old modeling days and might try a couple of passes on my proof-of-concept fuselage section that I used to experiment the different coverings between the vinyl and FM. So, we'll see. Should I elect to try the transfers, I'll definitely post the results. Gary - Was just thinking about you this morning and where you were on your P51. Glad to see you are moving along but sorry you need to hide from the homeowners assn. but you will be back to work soon. Thanks for the link to the WWII site, I'll visit them for my F6F colors. Looking forward to more photos when things get back to normal.